Have fun re-creating favorite moments from the Disney Frozen movie! 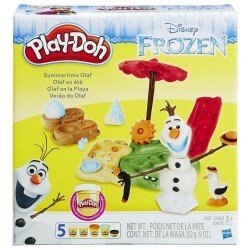 Visit Elsa's palace and create her ice magic with Play-Doh compound. 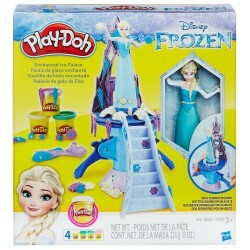 Send Elsa spinning through swirls of Play-Doh ice and snow by pressing the levers! Make a cape she can wear and decorate her dress with snowflakes. 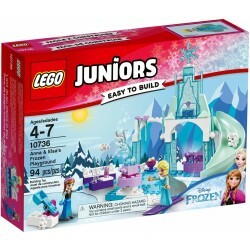 Cover the castle in icicles and even more snowflakes, too. Complete the fun with molds of Olaf, Marshmallow, and other fun shapes, and sparkly white compound helps creativity shimmer! Includes castle playset, cape cutter, roller, Olaf knife, 2 cans of Play-Doh Brand Modeling Compound and 2 cans of Play-Doh Sparkle Compound.